Biology Department, Copernicus Hall, 1615 Stanley Street, New Britain, CT 06050-4010. Novon 20: 186 - 189. 2010. Figure 1. Flower at center shows pistillate phase (anthers undehisced); flower at lower left shows what this flower will look like 24 hours later, the hermaphroditic phase. Photo by Thomas Mione of plant grown from seed of type collection. Figure 2. Back of flower showing calyx. Each sepal (in cross section) is recurved. Photo by Thomas Mione of plant grown from seed of type collection. Figure 3. Flowers in hermaphroditic phase, and flower buds. Photo by Thomas Mione of plant grown from seed of type collection. Figure 4. Ripe berry. Each sepal continues to be recurved both in cross section and away from fruit. Unripe berries upper right. Figure 5. Younger stems of J. bohsiana are green or purple. Plant grown in a pot in Connecticut from seed of the type collection. Figure 6. Only the oldest / widest stems of J. bohsiana are brown. Note the purple (relatively new) stem on the left originating from ground level. The stem on the right was harvested to make the photo of a stem cross section shown lower on this page (Figure 8). Plant grown in a pot in Connecticut from seed of the type collection. Figure 7. Ventral face of undehisced anther showing insertion of filament into anther at base of ventral face (metric ruler vertically on right edge of photo shows photo is 2 mm top to bottom; anther had been stored in 70% ethanol prior to photo; Mione 365, photo by Thomas Mione). Young Branches purple proximally, green distally except for purple nodes; stem of seedling densely pubescent. Calyx at Flowering the calyx purple, darker at tips of the lobes on adaxial face, 5–-6.8 mm diam., 2.5–-3.25 mm pedicel to lobe tip (4–5.5 mm with ripe fruit), 1 mm from pedicel to sinus (2 mm with ripe fruit), the calyx lobes both recurved and concave in cross section. Herkogamy? Yes. The hermaphdroditic phase lasts two days; during these two days at first the filaments angle away from the style putting a few mm between the stigma and anthers, and later the same day the dehisced anthers were very near the stigma or in contact with it. Calyx at fruit maturity see Figure 4. Self-Compatible? Yes. I grew this species as part of my dissertation research (Mione, 1992), and wrote on page 35 "all species of section Jaltomata abundantly self-set fruit in a pollinator-free greenhouse." Seed Germination Seeds (of the type collection) germinated at room temperature in Connecticut without chemical or mechanical treatment. Germination of seeds (planted at the same time) is not simultaneous: Seeds planted 13 Feb 2009 showed first signs of germination on 22 Feb 2009, 9 days after being sown and seeds continued to germinate through March 2009. Jaltomata bohsiana Mione & Spooner. TYPE: MEXICO. México: on S side of road from Rt. 130 (134) to Valle de Bravo, 2 km E of San Ramón, 19°10' N, 100°01' W, 2450 m, pine forest with epiphytic vegetation, growing in soil next to drainage ditch, rare, 15 Oct. 1988, D. M. Spooner & J. Gómez 4253 (holotype, CONN; isotype, MEXU), grown in Connecticut as Mione 365. Planta erectus, herbaceus; inflorescentia flores 5-7 gerens; calyx pupureus, 5-6.8 mm diametro, sepala recurvata, in sectione transversali concava; corolla pallide viridis, 5-lobatis, ad extremum 20-24 mm diametro; baccae maturae atrae nitidae, subsphaericae, 6 x 8 - 9 x 11 mm. Three types of trichomes were observed on this species, all unpigmented. 1) Those of the young leaves, axes and corolla margin are uniseriate, multicellular, almost always unbranched, gradually taper to a point, appear to lack nuclei, and vary in length. 2) Trichomes of the adaxial face of the corolla are living, 0.3 mm long, only distal cells contain dense cytoplasm, and the distal end of the terminal cell is rounded, not pointed. 3) Trichomes of the abaxial face of the corolla are 0.075 mm long, living and have a multicellular head borne on a unicellular stalk (as illustrated in Mione & Serazo, 1999). The multicellular head stains densely with neutral red but the stalk cell does not absorb this stain. Distribution, Ecology. Jaltomata bohsiana is known only from the type locality, a pine forest with epiphytic vegetation. Etymology. The species epithet honors Lynn Allison Bohs, noted solanologist. Discussion. Jaltomata bohsiana is similar to the widespread and variable species J. procumbens (Cav.) J. L. Gentry. The former is distinguished by having a smaller purple flowering calyx to 6.8 mm in diameter, calyx lobes both recurved and concave in cross section, and a fruiting calyx to 10 mm in diameter. In contrast, J. procumbens, has a green (sometimes with purple lobe tips) flowering calyx that is not recurved, lobes that are not concave in cross section, with a diameter larger than 7 mm, and a fruiting calyx diameter greater than 10 mm. The seeds and pollen of J. bohsiana are noticeably smaller than those of most but not all collections of J. procumbens. Attempts to hybridize J. bohsiana with other similar Jaltomata species produced either no fruit-set, hybrid seeds that did not germinate, or hybrids with low pollen stainability (Mione, 1992). The DNA sequence for the gene waxy (GBSSI) shows in J. bohsiana a unique 27 base insertion, a duplication of the 27 bases immediately upstream of the duplication (Miller et al. 2011). The type collection of J. bohsiana grouped with the other Jaltomata of the Mesoamerican clade in the plastid DNA phylogeny by Mione et al. (1994). 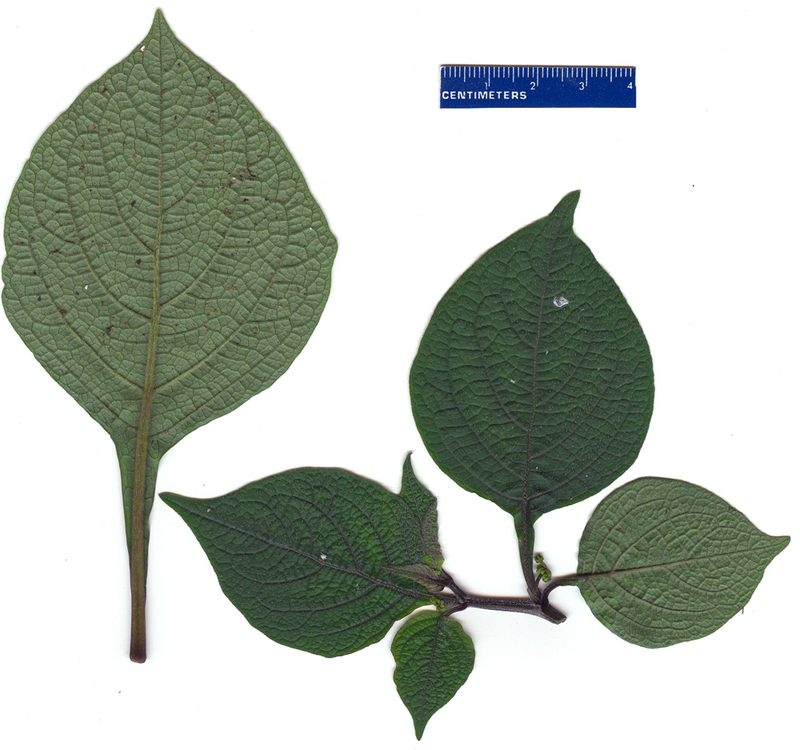 Although Jaltomata specimens have been borrowed from numerous herbaria, other specimens of this species have not been seen. Paratypes. Specimens made from cultivated plants grown at the University of Connecticut and CCSU greenhouses and outdoor gardens, from seed of the type Spooner & Gómez 4253 (CONN, MO). In my dissertation (1992) I planned to name this species Jaltomata spooneri, and so the description in my dissertation of J. spooneri (pages 29, 93 & 94) is actually a description of this species. Years later, the name J. spooneri was used for a completely different species. In 1994 my taxonomic understanding was less developed: In Mione et al. 1994 (Systematic implications of chloroplast DNA variation in Jaltomata and selected physaloid genera Solanaceae, American Journal of Botany 81: 912-918) Jaltomata bohsiana was (at that time) considered one of two collections of J. conspersa included in the study. Figures 8a and 8b. 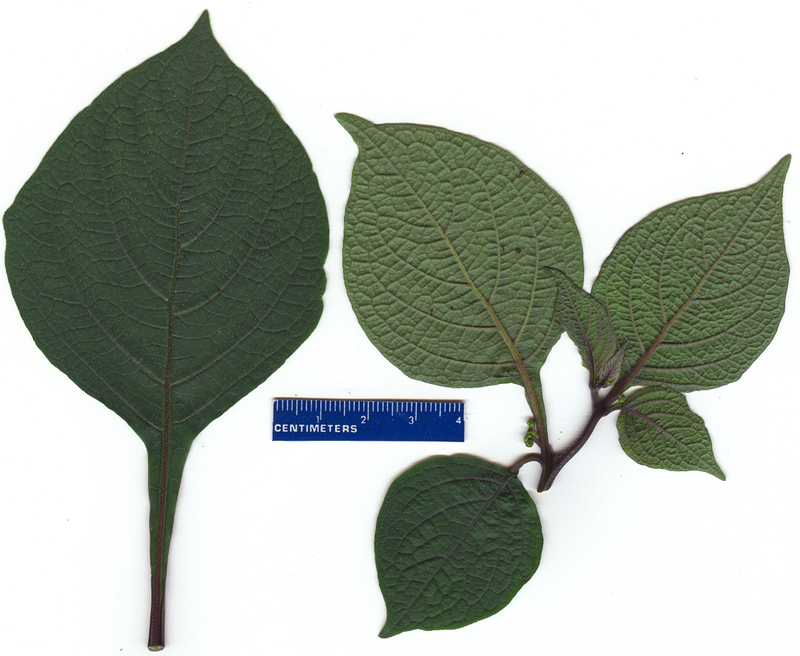 The left leaf is among the largest seen (few leaves were this large); on the lower photo the underside of the left leaf is up. The leaves on the right are the most common size encountered; darker green is the upper side of leaf and lighter green is the lower side of the leaf. These leaves were scanned while still fresh by Thomas Mione, July 2009, plant grown from seed of type collection. Figure 9. Jaltomata bohsiana stem cross section near ground-level, where stem was widest. The blue-green tissue on the left is secondary xylem and the pith is at the extreme left. Cork (radially oriented files of cells) at stem surface (extreme right). Stem 12 mm diameter; the outer surface of the periderm (cork) was brown as shown in Figure 6. Sectioning and photo by Sarah Saunders at Central Connecticut State University, year 2009, plant grown from seed of type collection.. Figure 10. Jaltomata bohsiana stem cross section (stem square, 7 mm diam.). Collenchyma (lower right) is beneath the epidermis. Pith at top left. Note that phloem is located on both sides of xylem. Toluidine blue stain. Sectioned with razor blade by hand and photographed in 2009 by Thomas Mione; plant grown from seed of type collection. Figure 11. Jaltomata bohsiana stem (pentagonal, 5 mm diam.) cross section. Collenchyma (top right) is under the epidermis; pith at lower left. Toluidine blue stain. Sectioned with razor blade by hand and photographed Aug 2009 by Thomas Mione; plant grown from seed of type collection.. Figure 12a. Jaltomata bohsiana petiole cross section. Note a single crescent shaped vascular bundle, and collenchyma under the epidermis. The projections at top left and top right are leaf blade. Cross section made by hand with razor blade August 2009, stained with toluidine blue. Plant grown outdoors in Connecticut, USA. Microscope 40X. Photo by Thomas Mione; plant grown from seed of type collection. Figure 12b. Jaltomata bohsiana petiole cross section, blowup of portion of vascular bundle (same microscope slide as in photo at left). Note the presence of phloem on both sides of the xylem. Microscope 100X. Photo by Thomas Mione; plant grown from seed of type collection. Figure 13. Stamen of Jaltomata bohsiana, ventral face of expanded base at left, anther (dehisced) on right (units along top are mm; photo had been stored in 70% ethanol; photo by Thomas Mione of Mione 365). Plants were grown from seeds of the type collection, summer 2009. Plants were grown outdoors in pots (not in the ground). 20 Sept 7:40 am Corolla open. Filaments have elongated. Anthers remain undehisced. 8:30 am Two anthers, possibly 3, are dehiscing. The longitudinal slit opens first at the distal end of the anther. 9:10 am At least 3 anthers are dehiscing. Filaments angle away from the style at an estimated angle of 30 - 35 degrees, resulting in spatial separation of stigma and anthers. 9:35 am At least 4 anthers dehiscing. No nectar observed, and I am not sure if lack of nectar is real or due to angle of lighting or real and plant needs watering to get nectar production going. I watered plant. 10:00 am 4 anthers dehisced, one in the process of dehiscing. No nectar seen. 11:45 am all 5 anthers have dehisced. Filaments angle away from style while corolla is rotate. 4:00 pm nectar droplets very inconspicuous (where corolla meets androecium). Filaments now bowing slightly, orienting anthers closer to stigma. 6:30 pm, 7 pm Filaments bow anthers toward stigma but anthers are not in contact with stigma. Corolla relaxing (closing). 21 Sept 6:40 am The combination of the filaments being bowed and the corolla being relaxed are placing the dehisced anthers at the stigma. I am not sure if pollen was transferred to the stigma by this placement. 1 pm Filaments angle away from style the way they did at mid-day 24 hours ago. Flower continues to be functionally hermaphroditic. Summary The pistillate phase lasted one full day (anthers were undehisced and filaments were short). The hermaphdroditic phase lasted two days; during these two days at first the filaments angled away from the style putting a few mm between the stigma and anthers, and later the same day the dehisced anthers were very near the stigma or in contact with it. This could be delayed self-pollination, but bagging to exclude insect visitors would need to be done to confirm this. Acknowledgments. I thank the curators of BH, COLO, F, K, MO, NY and US for their loan of specimens, and Kanchi N. Gandhi for translation to Latin.